La Mort a moissonné mon bien en sa verdeur. Un cercueil tient enclos mon espoir et mon cœur. Je sens par son trespas une douleur plus forte. Tant la mort me rempestre au labyrinth d’amour. Death harvested my treasure in her prime. Is a coffin, holding my hope and my heart shut in it. I feel in her death a grief that’s stronger. Love re-entangles me so in the maze of love. Sous mesme sepulture avec sa belle cendre. Je ne sçaurois plus vivre, et me fasche d’attendre. Ayant de leurs rayons mon ame gouvernee. Et me fit de son soir accomplir ma journée. Beneath the same tomb with her fair ashes. I could not live longer, and am impatient with waiting. My soul governed by their rays. And made me finish my day in its night. Blanchemain retains the same text, but footnotes the altered last line of the 1578 edition: “Et me feit de ses pieds accomplir ma journée” (‘And made me complete my day’s journey in its footsteps‘). The concluding stanzas of the poem. Que seule tu sois bien-heureuse. Tu me dois part de ta lumiere. Ne me laissant que la misere. Qui ne vit qu’une matinee. Me desplaist et je le mesprise. Pour n’en tracer plus de semblable. Où s’engluoit la raison mesme. Si douteux à rendre responce. Va-t’en ailleurs je te renonce. Comme le but que je desire. Qui fut l’honneur de ton empire. Le nœud dont ta beauté me lie. That you alone are fortunate. You owe me part of your light. Which lives but for a morning. Displeases me and I despise it. Into the light my Eurydice. So as not to design another. On which even my reason got ensnared. So uncertain of gaining a reply. go away, go somewhere else: I renounce you. Will be like the goal I wish for. Which was the ornament of your reign. The knot with which your beauty binds me. Again, there is only one variant in Blanchemain. In the middle of the 4th stanza from the end, he changes the preposition “Où tu soulois tendre tes laqs / Tes hameçons, et tes apas” (‘In which you used to set your traps…’). Frankly, this seems to me (a non-native speaker) to be what Marty-Laveaux’s text should say too, since I have in my view ‘fudged’ the translation of that version, not having seen ‘tendre’ used elsewhere in the sense I’ve given it of ‘falling into’ a trap rather than ‘setting’ one. For those who’d like the poem all in one place, here is a Word doc containing both versions complete. Here are the middle stanzas of the poem. Que c’est qu’aimer ? hà, doux refus ! Vous n’estes plus qu’un peu de cendre. Qui n’aura jamais de seconde ? Long temps demeurer en ce monde. Comme prest de suivre ses pas. Qui si doux me sonne en la bouche. Je feray rompre sous mes plaintes. Est terre qui ne peult renaistre. Que par penser je ne la suive. Je m’en vay faire un long voyage. Ne sçeut prevoir ma destinee. Du ciel assise entre les anges. What it is to love? Ah, sweet denial ! You are no more than a handful of ashes. Which will never have a second? Remain for long in this world. Since I am ready to follow her steps. Which sounds so sweet in my mouth. Split with pity beneath my laments. Is dust which can never be reborn. From following her in my thoughts. Could not foresee my fate. From heaven where you sit amongst the angels. Only one tiny variant in Blanchemain: in the 3rd stanza from the end of this section, he deletes the ‘”me” in the line, which thus becomes “J’eusse bien veu qu’elle disoit…” (‘I would have seen that she was saying…‘). Since the poem is so long, I have decided to ‘publish’ in several parts! De vivre je n’ay plus d’envie. Que ton arc par tout ne commande. De ta richesse la plus grande. Ou bien que je la suive absente. Et en la beauté tromperesse ! Que morte fust une Deesse. M’estoient doux pour sa souvenance. Que mon tout n’estoit sinon qu’elle. Et pour le corps seulement l’ombre. Ciel, que tu es malicieux ! Ne fussent maintenant que terre ? For life I have no more desire. That your bow is not all-powerful. Or indeed so that I will follow she who’s gone. That death was a goddess. Were kind to me, remembering her. That my all was only her. And in place of her body, just her shade. Heaven, how malicious you are! Would now be nothing but dust? Ou que ma moitié j’accompaigne. Or that my other half I can accompany. Dessus estoit escrit Le tombeau de Marie. Amour est donc sujet à nostre humaine loy ! Puis que par une mort sa puissance est perie. Qui de la triste mort m’annonça la nouvelle. Mes pieds avec les siens ont fait mesme chemin. And above was written: The tomb of Marie. “Love then is subject to our human law! Who told me the news of this sad death. My feet with hers must make the same journey. The beginning of the second part of ‘Marie’, added by Ronsard in the 1470s following her death. Ronsard sets the tone promptly, and effectively, with this dramatic vision. Ronsard translated a number of poems by Michael Tarchaniota Marullus, a favourite Neo-Latin poet of the late 15th century. Today, sadly, Marullus is nearly forgotten. If you are like me, when you see a footnote in an edition claiming that a poem is a translation of another one in another language, or an adaptation/response to one in the same language, you want more than the footnote – you want to see the original poem to appreciate the correspondences, the re-imaginings, the way in which the poet has adapted the original to make it a true poem in his own terms. Apart from a few songs at the opening of Amours 2, the chansons in that book represent a ‘run’ of translations of Marullus dotted through the book. 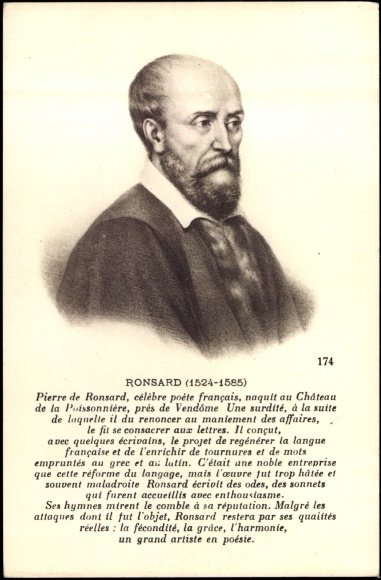 A set of links that show the Epigrammata of Marullus corresponding to Ronsard chansons – or the Ronsard chansons corresponding to the Marullus epigram – is here. In each case the Latin epigram & its translation appear with the entry for the corresponding chanson. Edit: the tables of correspondences between poems etc have now moved to a page you can access under the ‘What? Why?’ tab, or via the link above.